Mandas Disney Blog: Peter Pan's Flight! Welcome to another post in my Disney Summer Fun Series! This week's Guest Blogger is the amazing Disney Donna Kay! Her Blog is brilliant! If you've been before, you must know all about her amazing 'Mentoring Mondays'! She's interviewed loads of the best Disney Bloggers out there and shares great blogging tips and hints from all her interviewees to help us learn and become better bloggers ourselves! For the full list of all those who have taken part so far, check out her 'Mentoring Mondays' page! Trust me ... you don't want to miss it! Donna Kay is one of the most kind and generous Disney bloggers I know ... I can't thank her enough for asking me to co-host one of her 'Mentoring Mondays' way back in May! I had only been blogging for a month so it was a confidence booster to say the least! :) Ever since she's been so supportive of my blog and is a wonderful Disney pal! Please be sure to check out her awesome Disney Blog! Thank you SO much Donna Kay for taking the time to be a Guest here at Mandas Disney Blog! If you have ever visited a Disney Park in the Summer, you know looking for a break from the heat and sun is a necessity. On our recent trip to Walt Disney World the temperatures were above 80 when we left our resort for breakfast in the mornings. Our favorite way to cool off and rest our tired feet was to visit the Darling family in London via Peter Pan’s Flight. 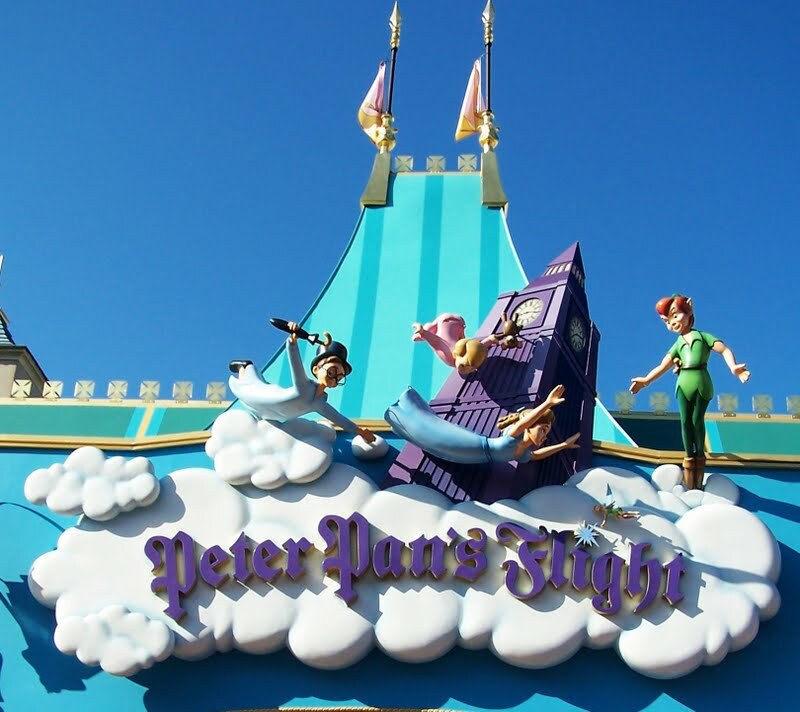 Peter Pan’s Flight has been at Walt Disney World since it opened in 1971. It’s such a classic ride, but it was really cutting edge at the time Disney World was built. You begin your journey in a magical sail boat that is destined for Neverland. The first scene is the Darling nursery, and it has such great detail. Next you are outside their home with Nana trying to figure out how to hop on board. Then it’s over the streets of London with Big Ben and London Bridge up ahead. Now it’s on to see the Lost Boys and Indians, and Oh no! Hook has kidnapped Tiger Lily!! Then you visit the Mermaids in the lagoon, and you see Mr. Smee and the pirates aboard Captain Hooks ship making Wendy walk the plank. As you see the Captain himself balancing on the croc’s open mouth, in you heart you know one day Hook’s luck is going to give out and that crocodile is finally going to have him for dinner. Then it’s back to the place it all began, London to bring the Darling children back home. Mike visited Disney World with his mom and sister in 1976, Peter Pan’s Flight is one of the few attractions he remembers. Somehow riding it takes him back to his childhood again. Considering my husband is not a Disney guy, it’s great such a simple ride can bring him so much joy at the age of 46. I can honestly see in his eyes how much he enjoys this ride. We even got Fastpasses and rode again less than an hour later to experience it all over again. I imagine pure joy was what Walt Disney had in mind when we dreamed of, then built Disneyland and later Disney World, and that’s exactly what Peter Pan’s Flight does for my family. I encourage you to ride a favorite from your childhood on your next visit to a Disney Park, I think you will be pleased with the results. What a great way to escape the summer heat! I absolutely love this attraction in Disneyland Paris! Once again Thank You SO much Donna Kay for being my Guest! Please be sure to check out her blog! Especially her Mentoring Mondays series! Great choice Manda, I totally agree..
Manda, thanks so much for asking me to be a part of your Disney Summer Fun series. I am honored to be included with so many wonderful bloggers. You are a true Superstar in the making!! I don't know why I love this attraction so much, but I sure do. When we ride, I narrate the story for my kids and try to point out points of interest for them. My daughter loves searching for Ariel. One of my faves too! I think it was deeply embedded in me in'76 as well:). Especially since I went on as an adult to live in London and marry a Brit...lol. A classic attraction! Thanks Manda and Donna!! Manda- Yes, we've done the ride at DL, WDW and DLP, and they are all very similar. The DLP version is the longest, but I have to say that I think the WDW one is the prettiest (I love its view of London). DL and DLP are almost identical. It's all good!! I too love Peter Pan's Flight. There is just something about that ride that takes me back to my first visit! Thanks for letting me relive the ride, Donna Kay! I, too, love Peter Pan's flight! I'm still so upset I didn't get to take the kids on it on their first trip to Disney :-( Guess that just means we'll have to go back! I had no idea Ariel was in this ride Dizzneemomma! Thanks for the fun fact! DIS - You're so lucky to have done all three! lol! Thank you Beth! Aww no way Bird! You'll just HAVE to take them back real soon then I guess!! :P lol!